Veterinary care first came to Rushford when Dr. Gerald Thorington opened his practice in 1952. Dr. William Veley joined the practice in 1968 and he and Dr. Thorington built a new hospital in 1972 at its present location of 8840 Route 243, just east of Rushford, NY. 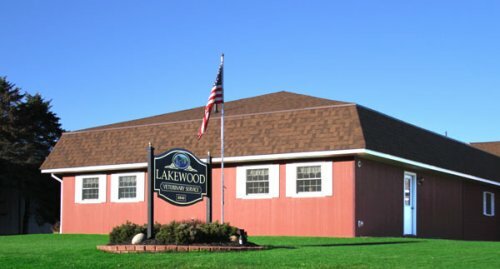 The practice was re-organized as Lakewood Veterinary Service in 1984 and has continued to provide veterinary services ever since. In 1993 Dr. Robert McNeill joined the practice, becoming a full partner in 1997. From the 1950’s through the early 1980’s, the majority of the clients were dairy farmers and horse owners. The small animal portion of the practice has continued to grow from the 1980’s to the present, requiring the construction of a large addition to the hospital in 2006. This addition houses a new reception area and new examining rooms. Today, we travel to farms in Allegany, eastern Cattaraugus, western Steuben, and southern Wyoming and Livingston Counties, and limited coverage in northern Pennsylvania. Presently, small animal services comprise about 35% of the practice. Dairy, equine, and other farm animal services comprise about 65%. Drs. Veley and McNeill currently employ two additional associate veterinarians. Dr. Marilyn Reynolds joined the practice in 2008. Dr Matthew Chuff joined the practice in 2012. Dr. Veley substantially retired from veterinary practice in 2013. The support team of five includes 2 licensed veterinary technicians, 1 veterinary assistant, and 2 receptionists.